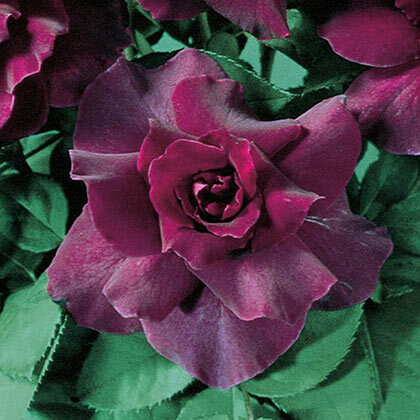 This All-America Rose Selections winner is sure to delight the senses. Clusters of medium-large, velvety, plum purple flowers perfume the summer air with their citrusy-rose scent. The flowers have the elegant hybrid tea form and long stems, making them ideal for cut-floral arrangements. Growing up to 5 ft. tall, Intrigue has a bushy habit. Blooms from late spring to fall. Plant in full sun to part shade. Zones 5-9. Flower FormPlum purple, fragrant, double blooms are medium-large, with a petal count of 25-30. Soil RequirementsWell-drained, sandy loam soil. 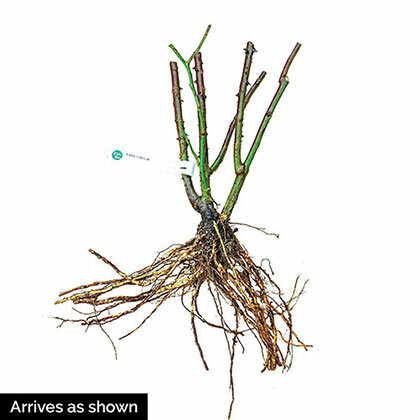 PruningSince rose bushes like to send out a strong lateral cane at the node just below a pruning cut, try to make pruning cuts about 1/4 inch above an "outward" facing leaf bud. By doing this and removing plant material from the center of the bush you will create a more open vase-shaped plant less susceptible to disease. Remove spent flowers to encourage rebloom. CommentsExtraordinary plum-purple color opens from rich, purple-red buds. Strong fragrance of citrus and rose perfumes the summer garden. Handsome dark green foliage. Established plants produce more blooms and the best color. AARS Winner - 1984.